Let’s be honest – when you walk into a well-stocked humidor, it may feel a little bit like Tennyson’s “Charge of the Light Brigade’ – cigars to the left of you, cigars to the right of you. Dozens of brands, hundreds of sizes in attractive, appealing nests from floor to ceiling. It’s positively overwhelming! Take a deep breath (not just to relax…you’ll enjoy the smell!) and remind yourself that buying a cigar isn’t rocket science, it isn’t even weird science, it’s just an interesting and enjoyable way to spend your money. Don’t spend ALL your money on cigars that don’t suit your fancy, you can start small and instead of buying a box, buy a single. The reward will be well worth the risk! People who work in tobacco stores are fountains of information. If you need some advice, feel free to ask. And don’t worry that your merchant will be offended if you don’t follow that advice. Cigar smoking is a completely subjective experience. Let the advice be your guide, not your jailer! You can ask your tobacconist for a recommendation, and what your merchant will suggest is a cigar that appeals to his/her palate. Instead, why not describe the kinds of flavors YOU like – spicy, smoky, deep, layered. That way, the professional can steer you in the right direction. Just Who Are “They” Anyway? Cigars get rating numbers intended to convey information about quality and characteristics. Although they may be helpful, you are much better off consulting reviews (rather than ratings) since they’ll give expanded information on things like flavor, finish, draw, etc. Using reviews, you can develop your own ratings, giving extra weight to the characteristics to the things that matter most to you. Tobacco derives much of its flavor from the soil and climate in which it’s grown. If you’re doing some comparison-shopping, you might want to pick up a smoke from Jamaica, Hondouras and Cuba to compare and contrast. This will give you a sense of regional differences in cigars. If you want a cool, clean smoke, think like McDonalds and ‘Super-size.” A long cigar with a high ring gauge (circumference) is something of a self-filtering device. The tobacco filters itself as you draw, delivering the flavor of the tobacco without the heat. How a cigar feels in your hand is important, too. If you’re uncomfortable with a big, cumbersome 9-inch Figuardo, try a 5-inch Belicosa in the same variety. The wrapper should be smooth and tight, and damage-free on both ends. Big veins should be rejected, but keep an eye out for small veins. They’re a GOOD thing and a cigar with a thin-veined wrapper often provides a nice, smooth smoke. You should let yourself go and experiment with different cigars. Sampling and evaluating the differences is one of the great romances people have with cigar smoking. Here’s a tip, though: if you’re feeling adventurous, but are not on a big budget, you should sample brands that are familiar to you and leave the “off-brands,’ ‘no-names’ and ‘generics’ for someone else. Off-brand cigars frequently have problems with their consistency, both within the cigars (uneven burning, hot spots) and also from cigar to cigar (no reliable flavor). So even if you love the no-name cigar you buy today, the chances of being able to duplicate its quality tomorrow are slim. The way a cigar feels will tell you volumes about its quality. Squeeze the cigar gently. It should have some “give” without feeling mushy or loose. Then run your fingers up and down the body to look for lumps or other irregularities. 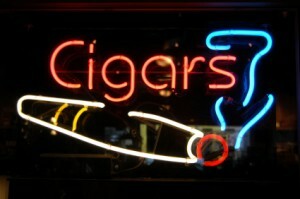 CIGAR STORE ETIQUETTE: Don’t roll a cigar in your fingers, as some suggest. This can cause damage to the wrapper and the construction and leave the tobacconist with a cigar that you don’t want…and no one else will either.